The Art of Diamond Setting is a training program for setting diamonds that presents 16 step-by-step lessons designed to teach the student progressive setting skills. Each lesson is accompanied with clear illustrations and instructive photographs. 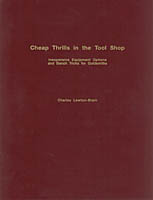 A chapter is devoted to tool and supply descriptions and their preparation. (1) Square Plate - Plane, Prepare Plate, (2) Square Plate - Plane, Set Stone, (3) Square Plate, With Excess Metal, Beveled Edges, (4) Square Plate, Excess Metal - Beveled Edges, Double Millgrain, (5) Square Plate, Excess Metal - Flat Edges, Double Millgrain, (6) Square Plat - Excess Metal, Swirled Bright Cut, (7) Square Plate, Three Beads in Each Corner, (8) Shield Shaped Plate, Prepare Plate, (9) Shield Shaped Plate, Set Stone, (10) Square Plate, Larger Plate and Stone, (11) Marquis Shaped Plate, Plane, (12) Marquis Shaped Plate, With Extra Metal on Ends, (13) Marquis Shaped Plate with Extra Metal on Ends and Sides, (14) Pre-Cut Octagon Shaped Plate, Prepare Plate, (15) Pre-Cut Octagon Shaped Plate, Set Stone, (16) Octagon Shaped Plate, Without Beads. Soft Cover, 9" x 11", 225 pages. Basic Jewelry Making Techniques shows how, once the basic techniques are learned, even the most apparently complicated pieces of jewelry can be made easily at home. The author covers every aspect you need to know to get started: the essential tools to buy, larger equipment that can be purchased as your skills develop, and some suggestions for workshop designs, including what to do if you have a minimal amount of space available. All the techniques needed to produce highly original pieces are explained with the aid of precise notes and instructive illustrations. Each project presented is flexible enough to be modified to suit your own interpretation of the design. All the technical information you need is at your fingertips in tables which give useful conversion formulae and temperatures. Topics covered include Laying Out Your Workshop, Essential Tools, Recommended Tools, Soldering Equipment, Large Equipment, Chemicals, How to Buy, Designing Your Own Projects, Transferring Your Design, Sawing and Piercing, Annealing, Soldering and Pickling, Using Wire, Filing, Texturing, Finishing and Polishing, Findings, Riveting, Doming and Shaping, Other Materials, Simple Rub-over Stone Settings, Forging, Engraving, Repousse and Chasing, Etching, Enameling, Casting, Reticulation and Fusing, Additional Stone Setting Techniques, More Joints, and Working with Gold. Soft cover, 9" x 11", 112 pages. Bead setting diamonds is the exclusive subject of this text. It is a diversification of the diamond setting field that has evolved into a departmental specialty in jewelry production establishments. Since bead setting is the fundamental procedure of pave setting, emphasis is given to the development and expansion of that procedure. The instruction is detailed and illustrative, and encourages the reader to pursue and innovate alternative measures to problematic segments. Each segment is written to benefit the apprentice as well as the experienced diamond setter. However, the instruction is advanced diamond setting, and therefore includes information not found in books intended for the beginner. Bead Setting Diamondsis organized into four major topical sections; Tool Preparation and Maintenance, The Bead Setting Procedure, Bead Setting Applications, and Advance Pave Setting. Hard Cover, 6" x 9", 192 pages. Channel Setting Diamonds with Illustrated Procedures is an advanced edition intended for professional use. The reader is assumed to have previously obtained skills in the use of tools and basic diamond setting experience. Some diamond setting schools and suggested readings are listed in an appendix. Major topics presented include inspection, layout, cutting the channel, cutting the bearing, securing the diamonds, and finishing. A second section with illustrated procedures presents the basic closed channel, basic open channel, curved channels, tapered channels, angular channels, and inlaid channels for round and square cut diamonds. Additional material is provided on channel setting problems and solutions. Hard cover, 6" x 9", 136 pages. Cheap Thrills in the Tool Shop is a profusely illustrated text presenting a loose, eclectic collection of short cuts, tricks and alternative equipment options for smiths. It represents a compilation of what are usually termed 'bench tricks' but might be properly termed "vernacular western goldsmithing tools and techniques". Most of what is described are tools that arise from practice, methods that are distilled from innumerable anonymous goldsmiths and metalworkers. A chapter on shop machines covers the anvil, buffing machine, casting machine, drill press, flexible shaft, hydraulic press, pickle pot, rolling mill, rotary tumbler, rubber mold vulcanizer, vacuum casting and investing machine, vacuum cleaner, and wax injector. A chapter on miscellaneous small tools covers bezel and bracelet mandrels, chasing tools, copper scoop, dapping tools, engraver's ball, files, flexible shaft tools, hammers, jump rings, pliers, pocket knife, raising compass, ring clamp, scrapers, stakes, swages, and wax tools. A chapter on procedures and associated tools includes drawing wire, mold making, polishing and finishing tools, burnishers, scoring and bending, soldering and soldering tools, stonesetting and its tools, and tubing cutting. Includes an appendix of supplier addresses. Soft Cover, 8.5" x 11", 80 pages. Work with glittering gold and sparkling silver to make the kind of exquisite, contemporary jewelry you dream of owning. In this complete sourcebook you'll find the key techniques that will open up endless creative processes for you. Learn the secrets of cutting and piercing; forging with different types of hammers to affect shape, size and texture; and joining metal with other decorative materials. Beautifully enhance surfaces, from embossing designs to producing a spectacular mirrored finish. Try related jewelry techniques, such as enameling, which lets you color metal in a wide variety of brilliant hues. Then practice your new skills on seven projects, including an elegant gold pendant with a handsome chain. 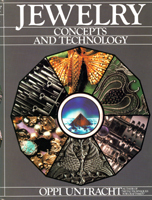 Contents include Introduction, Origins of Human Ornamentation, Contemporary Jewelry, The Properties of Metals, Alloys, Melting, Annealing and Pickling, The Care and Recovery of Metal, Preparing Basic Shapes, Filing and Sanding, Piercing, Soldering, Other Types of Joins, Making Domes and Cylinders, Forging, Hinges and Hinge Structures, Closures, Jump Rings, Acid Etching, Combining Metals, Granulation, Creating Textures, Metal finishes, Patination, Chasing and Repousse, Urushi (Japanese Lacquer), Enameling, Stone Setting, Wax Model Carving and Lost Wax Casting. Step-by-step projects include Repousse Pendant, Brooch, Articulated Bracelet with Clasp, Gold Pendant with Chain, Multiple Loop-in-Loop Chain, Hollow Construction Ring and Crocheted Chain. Soft cover, 9" x 12", 160 pages. 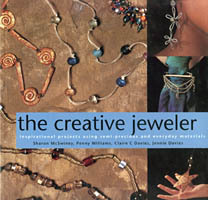 The Creative Jeweler presents comprehensive techniques and advice for working with a wide variety of jewelry making equipment and materials. Included are dozens of step-by-step projects for making decorative and stylish jewelry including broaches, pins, bangles, bracelets, chokers and earrings. 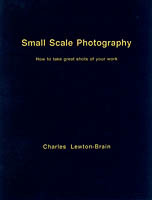 This book is well illustrated with color photographs and complete with a comprehensive technique section. It offers advice on how to work with various metals, ceramics and plastics to produce professional results whether the aim is something elegant, fun, classic or modern. Soft cover, 9" x 9", 160 pages. 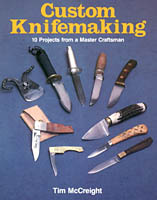 Custom Knifemaking spans the gap between pre-cut and art knives with step-by-step illustrated instructions for creating beautiful and unique knives. Learn how to make these projects, or designs of your own: kitchen paring knife, full-tang all-purpose knife, partial-tang carving knife, through-tang skinner, wilderness knife, forged camp knife, kitchen chopper, one-blade pocket knife, lockback folding knife, and Damascus steel dagger. Additional chapters cover tools, materials, knife design, sheath making, and forge set-up. Highly recommended for anyone with an interesting in making custom knives or simply learning more about the process and knife design. Soft cover, 7" x 9", 222 pages. The Design and Creation of Jewelry is a standard reference for hundreds of thousands of craftspeople, professional jewelry designers and students of jewelry making. 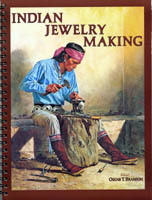 The author describes jewelry-making materials and tools, including directions for setting up and equipping the workshop, and such basic techniques as transferring designs to metal, cutting, stamping, soldering, pickling, coloring, polishing and applying fittings and findings. There is information on heat coloring, electrochemical polishing, burnout, vacuum-assisted casting, making rubber molds, and the techniques of marrying metals and thin-gauge lamination. Material on electroforming and reticulation is also included. Hundreds of photographs and descriptive drawings clarify techniques, illustrate new tools and specialized equipment for the workshop, and show the work of scores of artists working in repousse and chasing, annealing, casting, engraving, filigree, inlay and overlay, enameling, mellow, lamination and granulation. Soft cover, 7" x 9", 321 pages. Design Language brings fresh insight to students and practicing designers by examining the words they use. This compact volume presents 100 keywords with background etymology and commentary. Whether the word is as familiar as "edge" or perhaps new to you like "synesthesia", you'll find yourself moving easily from one entry level to the next, intrigued by the rich layers of meaning you discover. Teachers of design will appreciate the brief, clear and inclusive presentation. The dynamic layout invites notation, making the book a starting point for personal vocabulary, both visual and literal. The stitched binding is tough enough for years of studio use, and the compact size will fit into a toolbox or pocket. Design Language understands that a book can't teach design. Instead, it helps people learn by using vocabulary to explore style, form and composition. Hard cover, 4" x 7", 188 pages. The Diamond Setting Manual was designed as a reference source for common diamond setting procedures. It is intended for experienced professional diamond setters, and students under the supervision of a qualified diamond setting instructor. The text is divided into seventeen units of instruction based on a series of actual professional case studies. 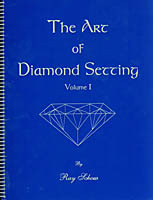 Each unit includes discussions and illustrations that describe how to set diamonds into a particular type of mounting. They are presented in a step-by-step sequence of events as recorded during the time of setting. Optional techniques are suggested throughout the manual for a variety of circumstances. Units include: Basic Prong Setting, Pin Point (illusion, miracle) Setting, Oval Shaped Diamond, Pear Shaped Diamond, Marquise Diamond, Triangular (Trillion) Shaped, Diamond, Square Cut (Princess) Diamond, Emerald Cut (Radiant) Diamond, Baguette Setting, Channel Setting, Bezel (Tube) Setting, Gypsy Mounting, Jewel Setting, Bar-Top Setting, Bead (Pave) Setting and Fishtail Setting. An Appendix of Tools and Techniques includes Graver Preparation, Burs: Selection and Use, Drilling, Filing, Sawing, Fixtures, Making Specialty Tools and Hammering-Tapping Techniques. Each subsequent unit is designed as a stepping stone for the next. In essence, this manual will provide an opportunity for diamond setters to progress to higher echelons of diamond setting. Highly recommended for anyone wanting to learn to set gemstones or expand their setting skills and knowledge. Soft cover, Spiral Bound, 7" x 10", 233 pages. Diamond Setting - The Professional Approach was written to teach diamond setting. It is basic enough to be understood by an apprentice who has very little background in the jewelry industry, yet sufficiently in depth to benefit an experienced diamond setter. In either case, the readers' backgrounds were kept in perspective throughout the text. The delivery of the text starts with the description and use of tools and conclues with the advanced chapter on bead setting. Each subsequent chapter is organized and designed to build up to the next chapter. 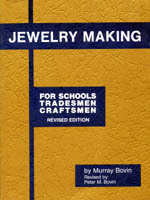 Chapters include: Introduction, Required Tool List: Description and Purpose, Selected Tool Preparation and Use Procedures, Pin-point Setting, Prong Setting Round Diamonds, Prong Setting Fancy Cut Diamonds, Bezel Setting - Gypsy Setting, Channel Setting, Fishtail Setting - Bar-top Setting, and Bead Setting. An appendix provides Suggested Readings, Diamond Setting Schools and an Index. Much of the information offerted in the beginning chapters is vital to the perfection of advanced diamon setting. The are many experienced diamond setters who can set diamonds into channel and plate settings, but very few have perfected their skills. The oranization of the material was written on the premise that bisic diamond setting must be mastered before a higher echelon is attempted. The primary teaching objective of this book is perfection. Its theme is two phased: First to present an authoritavie knoweledge of diamond setting, second, it is suitable to applied practice as shown in the illustrations. Therfore the book is actually a training manual to be used as a reference source for diamond-setting procedures. Hard cover, 9" x 6", 176 pages. A Diamond Setting - An Introductory Procedure how-to video by Robert R. Wooding is also available. 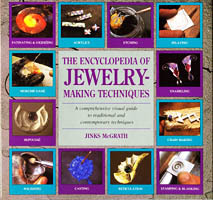 From simple techniques for bending or knitting wire to elaborate creations of gold and diamonds, The Encyclopedia of Jewelry Making Techniques describes all the essential techniques to create your own handmade jewelry. 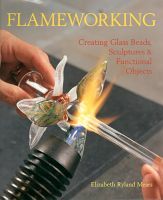 This authoritative book provides an overview of the basic equipment and techniques needed to work with traditional materials including gold, copper and silver as well as plastic and acrylic. An A-Z visual directory details more than 40 crafting techniques, from annealing and bending to ring-making and wire drawing. Each method is explained and illustrated through step-by-step text and photographs, and highlights the equipment and materials needed, placement and design ideas, and choices of finishing. Hard cover, 9" x 9", 176 pages. The flexshaft tool is probably used more often than any other available to the practicing craftsman. This machine and its numerous burrs, saws and other accessories free the jewelry maker from often laborious tasks and gives him the chance to preform numerous operations. 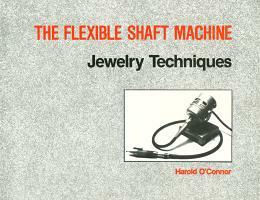 The Flexible Shaft Machine - Jewelry Techniques covers and presents information about Machines and Handpieces, Ring sizer and drill press, Wax turning lathe, Stone-cutting unit, Table saw, Burrs, Details of burr use, Finishing a cast ring, Sculpting a Ring with a cabochon, Creating a ring set with brilliants, Setting a brilliant stone in a bezel, Setting square stones, Constructing large prongs, Carving prongs, Prong sets and pearls, Stone ring with metal inlay, Cabochon-cutting, Metal inlay in carved stone, Plastics, Carving Wood, Turning tubes and wax on a lathe, Ivory-carving and inlaying, Chasing and engraving, Drilling, Riveting, Titanium, and Surface Textures. Included is list of suppliers and a gallery of flexible shaft machine work by contemporary artists. Soft cover, 11" x 8.5", 47 pages. This reprint from Gems and Minerals magazine presents an illustrated, step-by-step tutorial on making channel inlay settings with silver. Channel work has is often thought to be quite tedious because of the large number of soldered joints required. This pamphlet details a technique for eliminating much of the tedium associated with prior methods of doing the fabrication for channel settings. Part 1 covers working the wire and Part 2 covers the final silverwork and stone cutting. If you've been wanting to try channel inlay but are without a clue as to how to go about fabricating channel settings, this pamphlet is for you. Soft cover, 5.5" x 8.5", 12 pages. 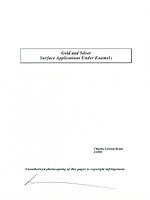 Gold and Silver Surface Applications Under Enamels presents information on Fusion Bonding Using Temperature Differentials for Control, Fusion Overlay, Incised Fusion Overlay, Etched Relief, Keum-boo, Depletion Guilding, Gold Applications Tool and Equipment List, and a bibliography. Soft cover, 8.5" x 11", 19 pages. Take your goldsmithing and silver work to the next level as you use time-honored techniques in new and exciting ways. Hundreds of color photographs illustrate both the methods you'll use and a rich variety of beautiful pieces created by talented artists. Innovative projects serve as an introduction to some of the techniques and include lovely square rings; a stunning traditional Berber bracelet; and a unique coffee service. The chapter on gems alone - featuring the work of Bernd Munsteiner, who is considered to be the best gem cutter in the world - makes this sourcebook invaluable to jewelry makers. 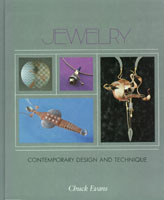 Contents include Introduction, Silversmithing, Methods and Procedures, Soldering Projects, Working with Wire, Stringing a Necklace, Working with Platinum, Kum Boo, Hand Engraving, Electroplating and Surface Finishes for Metals, Alternative Casting Techniques, Making Casting Patterns, Metal Stamping, Precious Stones, Cutting Precious Stones, Bernd Munsteiner, Master Gem Cutter, Four Concepts of Creativity, Image and Business, Photography and Jewelry. Step-by-step projects include Coffee Service, Square Rings, Prism, Earrings, Hinged Bracelet, Brooches, and North African Bracelet. Hard cover, 9" x 12", 160 pages. Quantity: Sorry Out of print untill August. 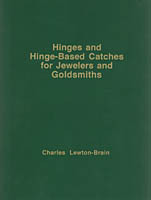 Hinges and Hinge-Based Catches for Jewelers and Goldsmiths is a profusely illustrated text dealing with hinge making, its considerations and tricks. Hinges and hinge-based mechanisms are incredibly important mechanical devices that are vital to linkage systems, jewelry making and metalsmithing in general. This book discusses these mechanisms and offers a reference to those time when you need to deal with a hinge-related problem you have not had to deal with before, or when you need to review information before starting a project. 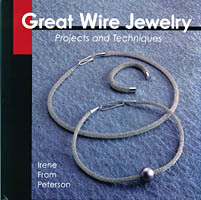 Chapters include Principles of Soldering and Construction, Making Tubing, Hinge Considerations, Making a Basic Hinge, Basic Knuckle Options, Hinge Pins, Further Hinge Types, Hinge-Based Catch Systems, Making a Locking Rail Catch, Tension-Based Catches for Hinged Bracelets, Even More Hinge Types, and Alternative Hinges. Soft Cover, 8.5" x 11", 112 pages. Indian Jewelry Making is a step-by-step how-to-do it tutorial and guide for making jewelry using traditional Native American techniques and motifs. It is lavishly illustrated with color photographs presenting hundreds of examples of finished work and scores of projects presented in step-by-step and exploded views. Among the topics and projects covered are making traditional style buttons, bolas, chains, rings, bracelets, conchas, buckles, earrings, hat bands, squash blossoms, necklaces, najas, boxes, hair pieces, collar corners, pendants, canteens, headstalls, whisker pullers, bells, pistol grips, letter openers, Kachina figures and more. Highly recommended for anyone interested in Native American jewelry and making jewelry in these traditional styles. Soft cover, 7" x 9/5", 120 pages. Jeweler's Resource has become a standard reference in the jewelry industry. This revised and expanded edition includes a new section on diamond grading standards, enhanced ring size information, additional metal weight charts and formulae, and even more entries in the extensive glossary. It serves as the most complete jewelry bench reference available. Covered are gems and gemology, metals and solders, chemistry and formulas, measurement and calculation. Soft cover, 7.5" x 10.5", 134 pages. Nearly ten years in preparation and production, Jewelry Concepts and Technology is the definitive guide and handbook for jewelry makers on all levels of ability. It is also a unique reference source for those not directly active in the field but who wish an understanding of what lies behind the jewelry making mystique. All traditional as well as innovative contemporary techniques are thoroughly described, making this the most comprehensive book available on the subject. The more than 900 photographs in color and black and white illustrate work of all degrees of complexity and show the incredible range of concepts which jewelers in all times, including today, incorporate in their work. Historic and ethnic jewelry, as well as contemporary work done by approximately 300 jewelers from 26 countries, are grouped under particular technical processes. This arrangement dramatically illustrates the mutual bonds between today's creative jewelers and their colleagues: historic style oriented, and anonymous, tradition dominated ethnic jewelers. The detailed text is accompanied by 377 illustrations showing tools and processes used to carry out particular techniques. In addition, 30 step-by-step photo demonstrations show master jewelers working in raw materials to finished jewels, some of them revealing their methods for the first time. Supplemented by an extensive index, glossaries of jewelry forms and findings, and an international sources of supply list, Jewelry Concepts and Technology is indispensable for anyone interested in any aspect of jewelry making. Highly recommended. Hard cover, 9" x 11", 840 pages. 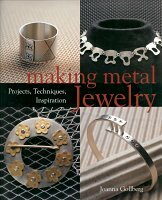 This comprehensive lavishly illustrated book offers all the information needed to create handmade jewelry and other metal objects. More than 65 metalworking techniques are clearly and concisely explained, supported by detailed, step-by-step photographs. Special features are detailed sections on anodizing aluminum, wire overlay-inlay, coloration of titanium, light weight thin-walled castings, twisted wire lamination and much more. Includes a comprehensive, detailed index of safety information which includes a guide to hazardous materials, their effects and appropriate precautions. More than 365 technical photographs and line illustrations. Hard cover, 9" x 10.5", 267 pages. Jewelry Craft Made Easy presents jewelry assembly as a craft that is fun, easy, clean and low cost. The projects presented require only a few hand tools, glue and some of the great variety of jewelry parts and gemstones available to hobbyists and craftspeople. 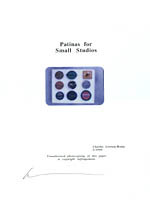 Soft cover, 5.5" x 8.5", 65 pages. Jewelry: Fundamentals of Metalsmithing offers the beginning and intermediate metalsmith clear and insightful instruction from a master teacher. It is lavishly illustrated, both with demonstration photos taken in the author's studio and with photographs of completed jewelry from a wealth of talented artists. Subjects include: Cutting and Bending, Pattern, Texture and Color, Fusing and Soldering, Cold connections, Finishing and Patinas, Stone Setting, Mechanisms and Chains, and Casting. 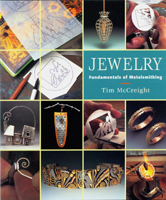 As both a fresh presentation of fundamental techniques and a portfolio of the finest contemporary design, Jewelry: Fundamentals of Metalsmithing is an instant classic in its own right and highly recommended. Hard Cover, 10" x 9", 142 pages. 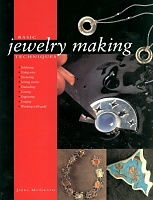 Presented in Jewelry Maker's Handbook are a wide variety of techniques beginning with simple projects and progressing to doing your own designing and making fine jewelry. Topics covered include the work area, tools and equipment, making a pierced pendant, heating and soldering techniques, polishing and coloring, stone setting, chain making, decorative techniques and design. Soft cover, 5.5" x 8.5", 64 pages. Jewelry Making presents the most practical and contemporary methods of making handmade jewelry to both the beginner and advanced craftsman. The information and techniques have been gathered, tried and developed through many years of actual work as a craftsman in the jewelry industry. The text is illustrated with numerous photographs and illustrations. Soft cover, 7.5" x 10", 288 pages. 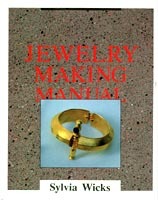 Jewelry Making Manual is designed to provide a strong foundation in traditional jewelry techniques, but also provides the best coverage to date of recent developments in reactive metals and anodizing. Each process is clearly explained and illustrated through clear photographs, many in color. Careful illustrations make even complicated techniques easy to understand. Covered are elements of design, basic techniques such as cutting, drilling, filing, soldering, bending, hammering and finishing, special techniques for working with plastics, textiles, beads and pearls, mounting and setting stones, enameling, casting, engraving, carving, chasing, stamping, coloring metals, inlay, chain making, and more. Hard cover, 8" x 10", 174 pages. Create a wide array of chic jewelry - without having to solder or use a torch. Cold-connecting metal is a great way to learn jewelry making because the tools are inexpensive and readily available, and the techniques provide a solid base for all types of metal work. From earrings to necklaces to bracelets, these sophisticated designs will showcase your creativity. Artistic and playful, the projects show how to achieve beautiful, inventive results that you can use as a springboard for your own design. A Basics Section covers Materials, Tools, Techniques, Findings and Finishing. The Projects include Modular Necklace, Beaded Dangles, Carved Ring, Sewn Pendant and Beaded Chain, Swirl Ring, Pyramid Necklace, Geometric Bracelet, Nut-and-Bolt Brooch, Blooming Rivet Band, Etched Copper Earrings, Floating Pearl Ring, Polka-Dot Tube Earrings, Bangle Bracelet, Screen Earrings, Sunburst Post Earrings, Layered Cuff Bracelet, Ladder Choker, Cone-Top Rivet Ring, Pendant with Prong-Set Cabochon, Mandala Bracelet and Art Deco Brooch. Also included is a gallery of designs by contemporary artists. Hard cover, 10" x 9", 112 pages. Patinas for Small Studios describes safer, easy patination methods for metals using easily obtainable and kitchen chemicals to produce blues, greens, browns, blacks, greys and reddish tones. Application methods and options for pattern and surface control are described, Soft Cover, 8.5" X 11", 34 pages. 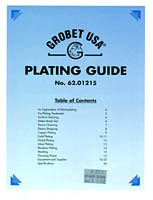 The purpose of the Grobert USA Plating Guide is to provide a description of some of the more common plating processes and to explain how these processes can be carried out using comparatively simple equipment. No knowledge of chemistry is required and it is assumed that prepared electroplating salts or solutions will be used. Covered are an Explanation of Electroplating, Pre-Plating Treatments, Surface Cleaning, Water Break Test, Electro-Cleaning, Electro Stripping, Copper Plating, Gold Plating, Nickel Plating, Silver Plating, Rhodium Plating, Masking and Throwing Power. Included is a catalog of Grobert USA plating equipment and supplies and specifications for Grobert plating salts and solutions. Soft cover, 8.5" x 11", 24 pages. Metal Corrugation is guaranteed to infuse and inspire you with the playful creativity this process has to offer. Using a variety of tools and techniques you will rapidly be taken beyond any traditional utilitarian appearance seen with corrugated material that is part of our everyday life. Discover how you can get those waves (and more) into you metal work. Several years in research make this book a must for personal expression in metalsmithing and a necessity in your personal library. Profusely illustrated with color photographs. Hard cover or Soft cover, 9" x 11.5", 137 pages. Techniques of Jewelry Illustration and Color Rendering brings the talents, expertise and individuality of outstanding jewelry designers into one volume. Presenting full instruction on jewelry illustration, with step-by-step guidelines and clear illustrations explaining each process, this volume is a valuable resource for designers, illustrators, marketing professionals and all students of design. Each design professional in this book takes a distinctive approach to rendering work, providing a splendid array of methods and styles of jewelry rendering from which to learn. By working on the projects presented the reader can assimilate the features in each method that meet individual requirements and style. 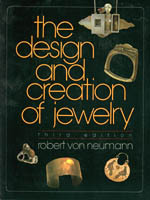 This book will help expand the reader's knowledge of professional jewelry design. With these skills, jewelry illustrations can be presented with accuracy, beauty and eloquence in the rewarding and challenging world of jewelry rendering. Hard cover, 9" x 11", 152 pages. 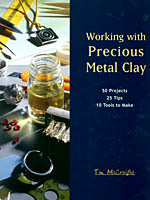 Working with Precious Metal Clay uses 50 projects to introduce the techniques and strategies for this amazing new material. In each case the sequential instructions and informative illustrations will lead you through the process from beginning to end. Along the way you'll learn how to cut, model, texture and assemble all sorts of objects from simple earrings to complicated vessels. In addition to the projects, 25 techniques are described that apply to all work such as construction tricks, rehydrating techniques, and polishing and coloring procedures. Hard cover, 9" x 11.5", 127 pages. The Art of Engraving brings to the reader - for the first time ever - a complete, authoritative, imaginative and detailed introduct5ion to and training in the art of gun engraving. It is a supremely unique book, for not only does it sweep aside the mystery which has surrounded engraving throughout the centuries, but it factually, simply and in laymen's terms tells you how to engrave. Unlike so many so called "instruction manuals", the The Art of Engraving does not assume you know anything about engraving. You start at the beginning by learning how to draw scrolls and layouts, the cut practice plates until you are sure enough of your ability to actually proceed in designing a pattern, transferring it to a gun and cutting it into the steel. Whether you want to learn to engrave now... think you might like to in the future... or simply with to broaden you knowledge of the art to be able to better judge the work of others (as you will learn to tell the good from the bad - and know why), this is the book for you. 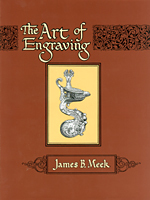 Hundreds of examples of master engraver's work to show specific styles, handling of designs, use of different techniques and the effect they achieve. Over 1378 photos, drawings, designs, illustrations and layouts. Thoroughly cross-referenced index with over 600 entries makes locating a specific tool, design, or technique fast and easy. Includes a comprehensive listing of important and useful reference books of design, engraving and metal work. Hard cover, 8.5" x 11", 196 pages.